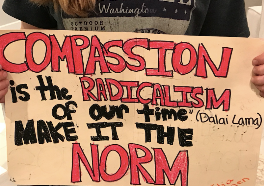 Claim 2: Palouse Prairie students are becoming empathetic and compassionate people. PPCS is dedicated to maintaining a school-wide culture of kindness and respect. Our team of teachers, Executive Director, CREW Counselor and staff engage in continuous collaboration to ensure our school culture is reflective of our values and expectations. In 2009, Palouse Prairie Charter School embarked on a journey to support students’ character development by teaching and modeling positive behaviors as the primary approach to discipline. Palouse Prairie has adopted and promotes a particular culture of values, which are referred to as character traits. 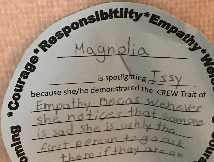 The relational character traits students are developing are courage, responsibility, empathy and welcoming, which signifies the idea of CREW. Our intention around character has translated into our students becoming empathetic and compassionate people. We ask students to report out how they interpret our school culture by completing a school culture survey twice a year and then we analyze this data to better understand trends in relational character. 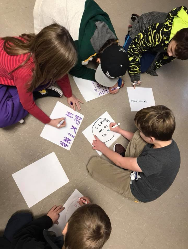 We show evidence of kind behavior and opportunities to practice becoming empathetic and compassionate through frequent morning meetings and CREW initiatives and community wide practices that promote the celebration of kind behaviors and the commitment to problem solving when issues arise. 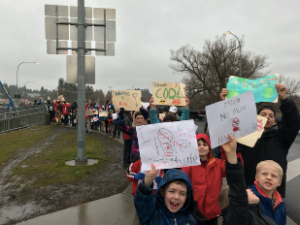 This school year, we also introduced an initiative that culminated in our entire school marching through the streets of Moscow, Idaho promoting kindness. Our decision to use a positive approach to discipline and promote our community culture has provided the foundation for individual classrooms to develop their own set of behavioral expectations. There are several classroom structures that support development of empathy and compassion in our students. Each morning, every CREW begins the day with a morning meeting. Morning meetings are designed to foster relationship development through students sharing about themselves, their strengths and struggles, and by participating in shared experiences. Morning meetings also provide daily instructional space for teachers to introduce students to CREW traits and the meaning of each trait. I can have courage to share something personal about myself. We are responsible when we do the right thing, even when nobody is looking. I will take a break when I am feeling grumpy so I don’t take it out on others or myself. We are empathetic when we help others when they are struggling. We are empathetic when we solve problems calmly, kindly, and without name calling. We are empathetic when we see how our actions impact others, then make it right. I can explain the meaning of empathy in my own words. I can share empathy by listening to understand and appreciate others. We are welcoming when we try someone else’s idea. 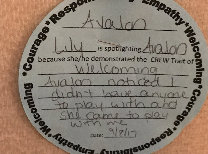 We are welcoming when we invite others (not just our BFFs) to work or play with us. 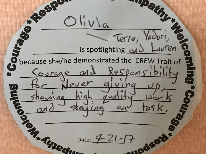 Specific Initiatives in CREW allow students opportunities to practice being compassionate and empathetic through collaborative tasks that require communication, problem solving, and flexibility. 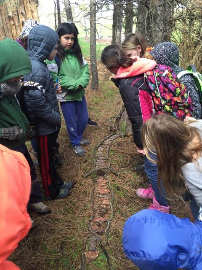 Two examples of this are the 5th grade CREWs collaborative art project and the 7th grade CREWs Tarp Flip challenge. 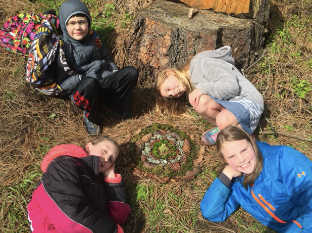 The 5th grade CREW worked with the learning target, I can embody the design principles Collaboration and Competition and The Natural World by creating a nature art piece with a group. They developed a plan and shared ideas with each other before starting to build their collaborative art piece. 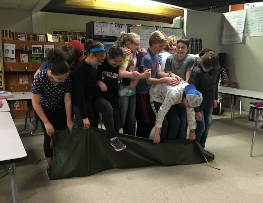 The 7th grade CREW worked across several days to complete a CREW challenge called the tarp flip. The task was designed to be physically challenging, and the crew was limited to a few of the members as speakers, while the rest had to participate as listeners. After the first day of working on the challenge, students were frustrated. They asked for resources that they felt could support them being able to work together in a more productive way, specifically a modified version of the challenge with a larger tarp. The next day, students were successful with the task, and the conversation that came from the debrief illuminated long standing assumptions crew mates had made about each other that were replaced with new understanding. 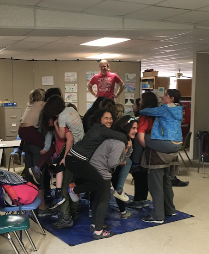 Students collaborate to flip a tarp over while keeping all feet on the tarp using effective communication and participation. What made this task challenging? What was your role during this task- the leaders, the followers, the listeners, the thinkers, the peacemakers? Why do you think I silenced most of the crew and asked only a few students to be the speakers? How does your role in the task compare to your role with your crew in class? These initiatives are part of the CREW experience at PPCS. We set the tone for achievement and engagement in developing character by engaging students in collaborative and competitive experiences in a joyful and supportive environment. After the experience, we circle up and debrief not only the task, but the behaviors that supported the successes and challenges within the task. This work has had a measurable impact at our school. 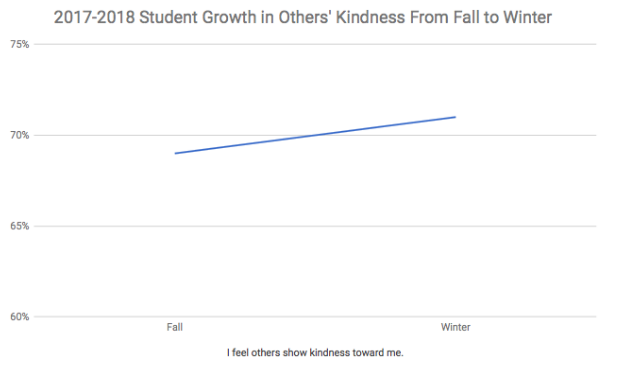 Students show growth in their ability to act with kindness and compassion. In the fall school culture survey, 75% of students reported that they show kindness to others either Always or Often. The winter school culture survey showed that 95% of students show kindness always or often. This pattern can be seen in the graph below. The total number of students that feel they often or always are kind to others is 164 students, the vast majority of our school (accounting for a small percentage of our students who were absent the day the survey was administered). Morning meetings and community meetings also focused on being kind and compassionate and developing the skills to appropriately problem solve when conflict arises, including being part of restorative circles. Students had two learning targets to master during this work: I can be an upstander. I can be kind and curious about our differences. 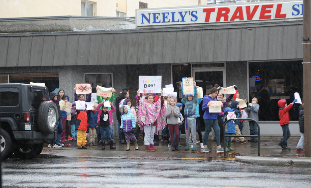 In recognition of No Name-Calling Week, the entire student body shared the message of kindness to the entire Moscow community with a #KindnessInAction sidewalk march through downtown Moscow. 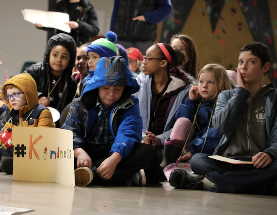 Students shared the message through visual signs and chants of actively adding kindness into every action and calling people the names they WANT to be called and avoiding slurs and stereotypes. 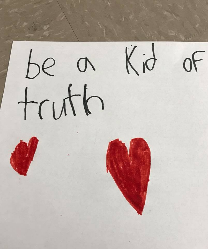 Students creating a draft of the sign they will carry at the kindness march. 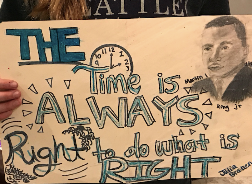 Students wrote spoken word poetry to express their perspectives and shared their messages at a poetry slam at One World Cafe, our local coffee shop, the evening of the march. Students wrote poems to tell their stories and communicate their messages of hope to end name-calling and bullying. We see a positive and measurable impact in our work on kindness and anti-bullying. 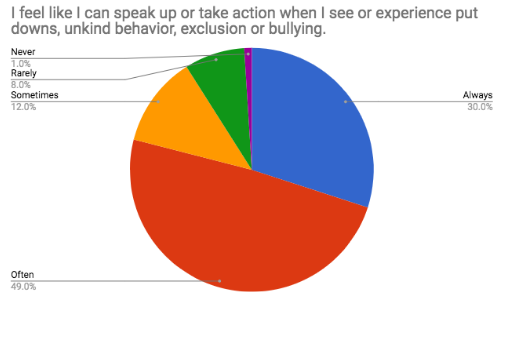 Almost 80% of our students feel that they can speak up or take action if they see or experience bullying. We also have noticed a decline in bullying incidents at our school. Last year, we had 6 bullying incidents that accounted for 8.5% of all behavior incidents. This year, we have only had 3 bullying incidents and that accounts for 2.75% of all behavior incidents. Our intentional work on kindness education and anti-bullying has contributed to less bullying in our school. It changed our culture by allowing our students to be courageously curious and gave them the skills to be empathetic and compassionate people. Students also participate in a weekly community meeting where all CREWs come together. During Community Circles, students publicly spotlight each other for demonstrating the CREW traits and design principles. Community circles also provide school wide opportunities to learn about kindness, empathy and compassion. Our practices of CREW and Community Meetings and spotlights encourages students to notice and celebrate the relational traits of their peers, and gives them an opportunity to develop language and actions associated with each of the crew traits. Our practices of school wide meetings, celebrating each other’s accomplishments in character. and intentional instruction on kindness, empathy and compassion have also had a measurable impact at our school. 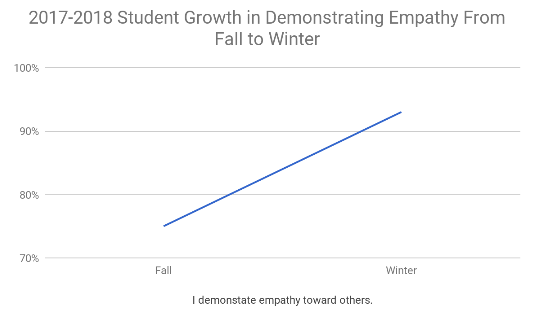 Students show growth in their ability to show empathy to others. 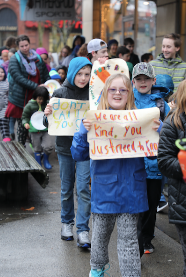 The work we did in the winter around kindness and the culminating events of the Kindness March and the poetry slam contribute to the increase in empathy, as do the school wide structures such as celebrating empathy and learning about empathy at Community Circles. While we are interested in how students perceive their own kind actions, we are also interested in understanding how students perceive the kindness of others. 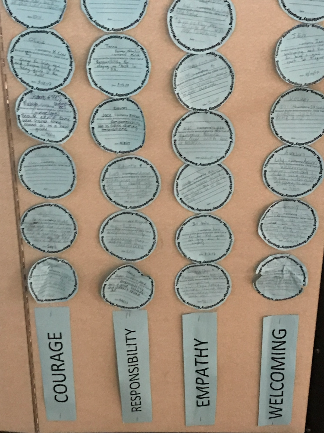 We realize that student self-reported data on kindness may have self reporting bias and felt that using several indicators from the School Culture Survey would help us fully understand how students are internalizing the traits of empathy and compassion. 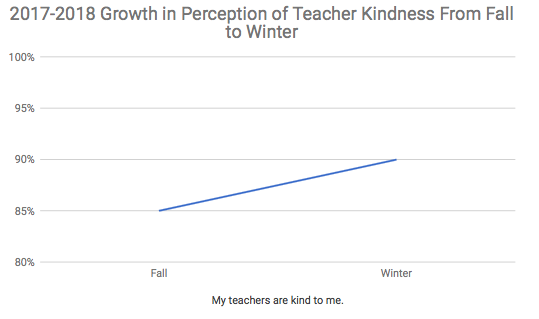 From Fall to Spring, the perception of others’ kindness improved as well. Again, the percent of students who feel others treat them with kindness started high- at nearly 70%. By the Winter survey time, this had increased to over 70%. Because our teaching staff has worked to model relational behaviors as part of our instructional strategy, we felt it was important to understand how students perceive their teachers’ relational traits. 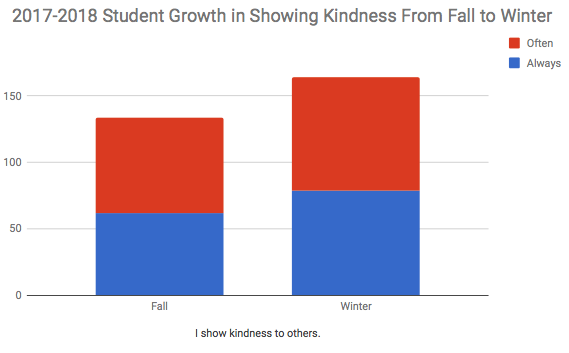 In the fall, about 85% of students felt that their teachers modeled kindness and were kind to them. In the Winter, this increased to 90%.